We’re excited to announce a major upgrade to PlayFab’s Multiplayer Servers feature, making it even easier to build, test, launch, and operate session-based multiplayer games. We have taken Microsoft’s proprietary battle-tested “Thunderhead” technology, used to host and scale AAA games like Halo 5, Sea of Thieves, and Rainbow Six Siege in the Azure cloud, and are now making this service available to all developers via PlayFab. Dynamically scale servers so you use only the cloud resources your game needs. Choose from 20+ virtual machine sizes, running either Windows or Linux. Deploy game servers using containers to simplify development and offer a more consistent player experience. Debug your virtual machines with remote access to run tools and interact with the server in real-time. PlayFab Multiplayer Servers 2.0 lowers the costs and complexity of hosting dedicated game servers, dynamically scaling servers to support your ever-changing player demand. PlayFab, Azure, and Xbox Live have worked together to integrate the Thunderhead technology with PlayFab, so all game developers can benefit from Microsoft’s deep experience running dedicated servers for games. Built on the Orleans distributed systems framework, and powered by cutting-edge Azure technology such as Batch job scheduling and compute management, this new service delivers the benefits of dedicated game servers through a cost-effective and highly performant multiplayer game server orchestrator. This allows you to focus on player experience and rely on Azure to dynamically and efficiently scale. Right now, we are announcing PlayFab Multiplayer Servers in a private preview format available to a limited set of customers. Later this year PlayFab Multiplayer Servers will be available to all PlayFab customers. We have several initial tutorials here, and will be adding significantly more content and functionality over the next several months, including major improvements to our matchmaking service. If you are an existing PlayFab Pro or Enterprise customer interested in early access to this feature set, please reach out to us at playcompute@microsoft.com or our Community channel on Slack. 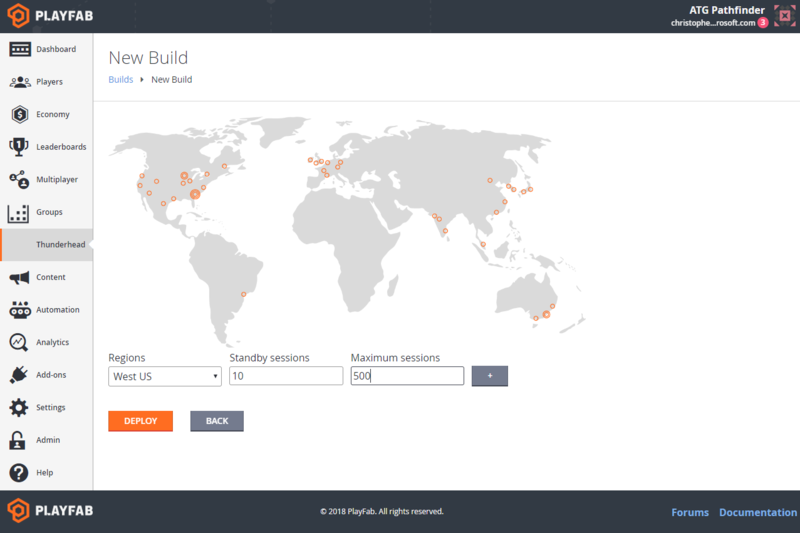 * Note that some Azure regions, such as the government regions, will not be available to PlayFab customers.